The types of storms that have been bringing heavy snow and rain to the West this winter, triggering landslides and floods while easing stubborn droughts, are likely to become stronger and more frequent, according to the results of a new study. The drenching storms have been falling from atmospheric rivers — high-altitude streams of moisture that carry much of the West’s water from the Pacific Ocean in sometimes-violent spurts that can lead to floods. The latest study to project an increase in the frequency and ferocity with which atmospheric rivers will reach the West Coast was published over the weekend in Geophysical Research Letters. Scientists described the analysis as more robust than earlier ones. Days on which atmospheric rivers reach the West Coast each year could increase by a third this century, if greenhouse gas pollution continues to rise sharply, Pacific Northwest National Laboratory researchers concluded after running model simulations. Currently, the West Coast is likely to receive rain or snow from atmospheric rivers between 25 and 40 days each year, the analysis concluded. By century’s end, that’s expected to rise to between 35 and 55 days annually. Meanwhile, the number of days each year on which the atmospheric rivers bring “extreme” amounts of rain and snow to the region could increase by more than a quarter. The results of the study were “consistent” with findings from earlier modeling-based studies, said Scripps Institution of Oceanography researcher Marty Ralph, who wasn’t involved with it. He said the study went further than others in demonstrating that the projections were likely to play out in the real world, rather than being the result of any modeling errors. Although storms caused by atmospheric rivers are needed to quench landscapes and fill reservoirs, they can also deliver deadly hazards. Momentous floods of the early 1860s, which affected several Western states, evacuating Californian lawmakers from Sacramento after the Central Valley filled like a tub, were linked to a series of atmospheric rivers. Scientists warn such floods could again beset the region under a winter storm scenario they call ARkStorm. 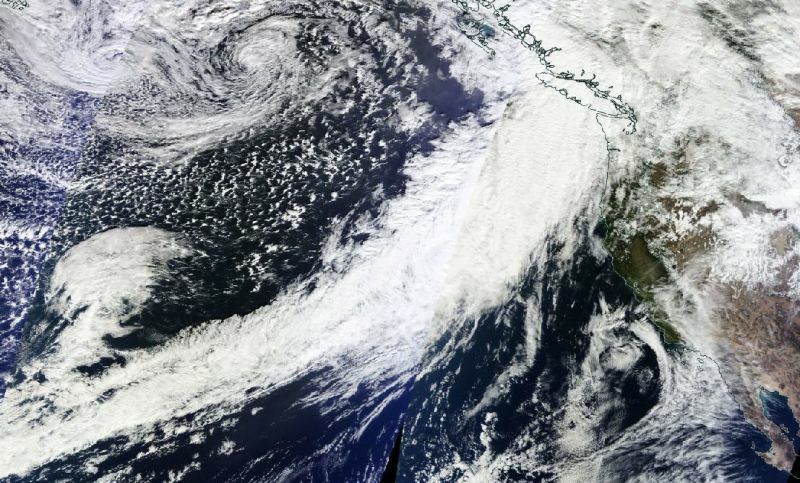 “What we noticed is that the entire West Coast of North America will experience increased atmospheric river frequency,” said Samson Hagos, a Pacific Northwest National Laboratory earth system scientist who led the new study. That’s largely because a warmer atmosphere can hold more moisture. Which would mean worse floods, more often. “The strongest atmospheric river events along the West Coast during the 20th century are strongly linked to flood events of historical significance,” said Daniel Swain, a PhD candidate at Stanford who researches extreme weather. “A reasonable inference to draw from these studies is that the risk of severe flood events along the West Coast will likely increase,” Swain said. The findings may also have implications for projecting tempestuous conditions in other regions as well. “This paper provides a nice framework for exploring storm variability in other regions of the world,” said Sarah Kapnick, a National Oceanic and Atmospheric Administration climate change scientist. But it’s harder to say what such findings might mean for the frequency or severity of droughts. Recent research has suggested that higher temperatures linked to global warming exacerbated the intensity of California’s ongoing drought, by drying out the state. It’s far less clear what effect climate change had on the likelihood that such a drought would occur. Rising temperatures are expected to accelerate evaporation and lead to drier conditions across the West — producing what scientists call hot droughts. Anchukaitis said atmospheric rivers don’t necessarily affect the conditions that produce hot droughts.